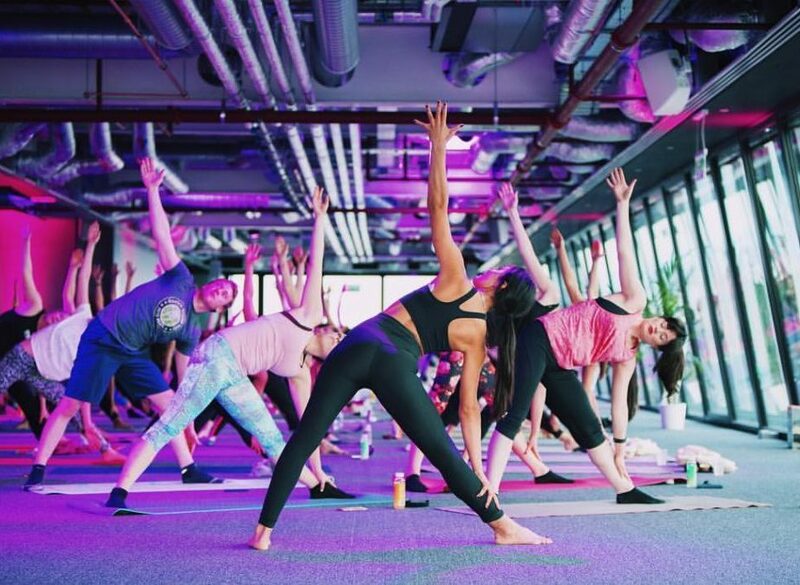 Whether you’re a Vinyasa virgin or veteran, a dedicated yogini or just easing your way back into a healthy lifestyle, London has got you covered with an abundance of yoga hot spots that cater for every style and every skill level. We know maintaining a consistent fitness regime can sometimes be a bit of a stretch, but with a studio or pop-up class around every corner, it’s no wonder yoga has become an essential practice for every desk-bound, city-slicking suburbanite. So without further ado, we’ve hand-picked the best spots to channel your zen, relieve you from common aches and pains, and help you find that local, supportive yoga community on the start of your fitness journey. If the stigma of balloon-pant attire and pseudo-spiritual facades is holding you back from embarking on your path to zen, Fierce Grace is a safe haven for the more-direct, no-nonsense, and no-fluff yogi. After leading the UK in the hot yoga revolution, Fierce Grace has built a reputation based on a less ‘uptight’ approach to the ancient spiritual practice. Classes are built on classical Hatha yoga, Bikram, and Ashtanga yoga, and combine strength with flexibility to promote health, emotional harmony, and mental clarity. Like it hot? The classes go down in a hot room (approximately 38 degrees) to allow optimum results in the minimum amount of time. What happens when you take a traditional bright, open space and cross it with infra-red heating and soothing studio-specific scents? You get a calming, tropical holiday-like warmth by way of Another_Space’s studios in Covent Garden and South Bank. They set the scene so all you have to do is turn up and get immersed in their tranquil surroundings. 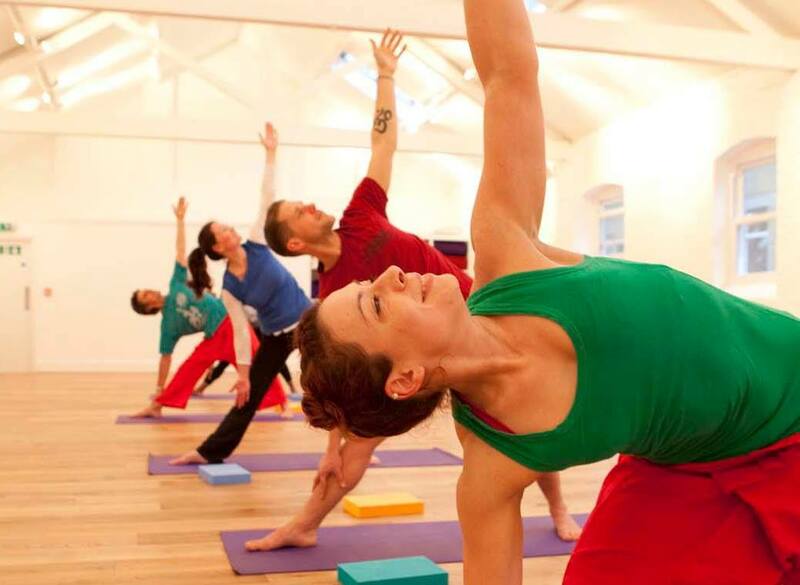 Described as ‘yoga for all’ their classes involve powerful breath and movements that work your strength and flexibility in equal measure to raise your heart rate and help your mental state. Plus, you get a handful of instructors (including Mind Body Bowl brainchild Annie Clarke) to choose from, whose main focus is to observe posture and soothe your stresses away. In true East London style, you’ll find Blok in Clapton and in an art gallery-inspired space in Shoreditch. Both spots epitomise hipster cool, from the exposed brickwork and steel beams found at the Clapton site, to the white minimalist vibe of the Shoreditch studio. 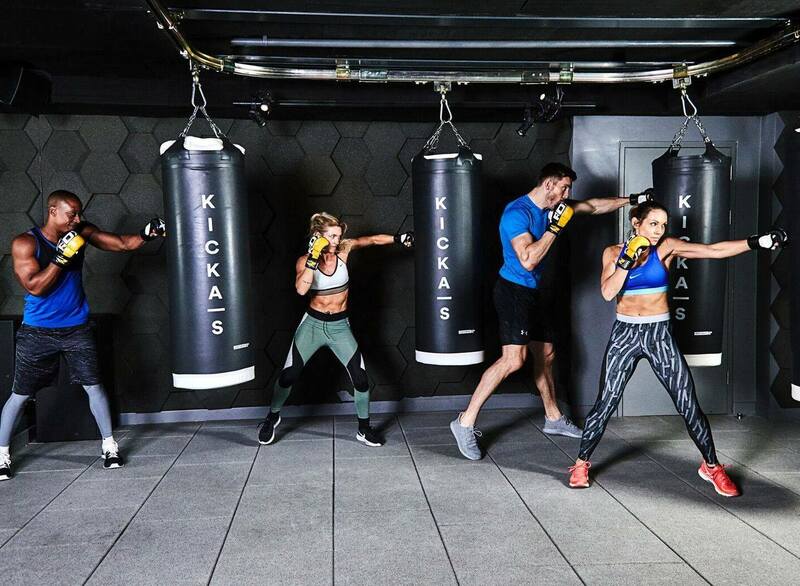 But clichés aside, the studios boast more than an appealing aesthetic — Blok takes pride in being a class-only gym, led by specialised and passionate instructors. Their yoga classes cater for a huge range of levels and styles, too — from beginners to intermediate and Yin to dynamic Vinyasa. Finishing touches include under-floor heating in the changing rooms and fancy Bamford products in the showers. As its namesake suggests, East of Eden combines art, culture, and physical rigour through their Walthamstow-based studio. The former tram works site is flooded with natural light via the floor-to-ceiling windows that overlook the quaint cobbled street that leads into their peaceful oasis. East of Eden offers nine contemporary fusion or classic yoga styles that cater for every level. And each class has its own passionate teacher with their own curated playlists for an uplifting experience. With bright and sunny interiors, spa-like scents and a general zen atmosphere, Heartcore’s studio spaces are enough to lure in even the most flustered, fitness-phobic Londoner. 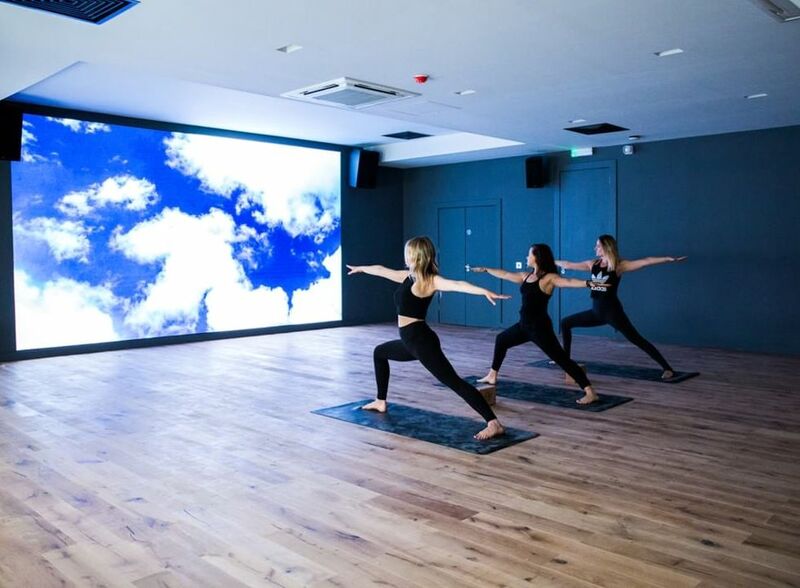 Founded by Jess Schuring (aka the woman behind the body of Elle Macpherson), the brand ethos is all about living a balanced life of positivity and well-being, which echoes throughout all nine of their studios across London. Their Power yoga sessions cater for all levels and involve a combination of mobility, strength, and breathwork — perfect for improving balance, flexibility, and stamina. In tandem with a completely chill playlist, count on a sweaty brow, proper intention, and a smile on your face. 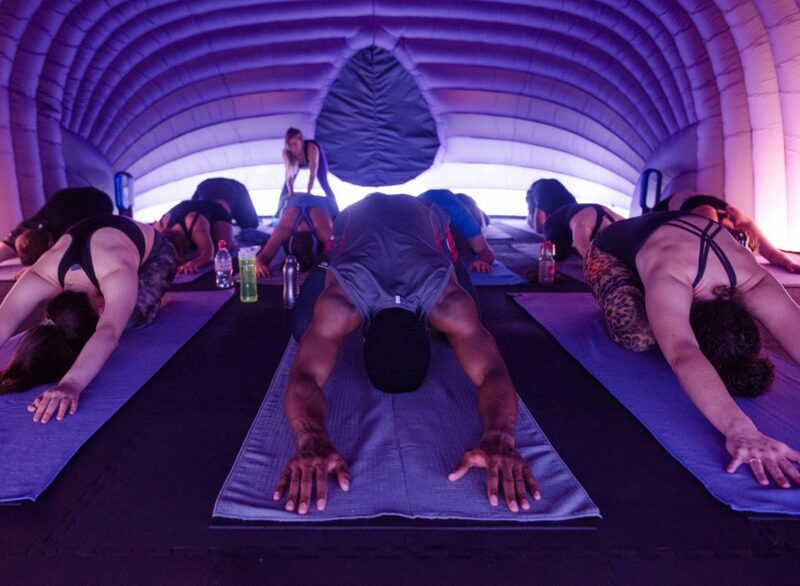 When taking a class at Hotpod, you’re basically stepping into a womb-like hybrid between a steam room heated to 37 degrees and a cocoon of blissful, tranquil purple surroundings. It’s what we consider to be the perfect way to limber up rigid muscles and stiff limbs through an effective combination of active and passive postures. Instructors at their Notting Hill, Brixton, Hackney, and South Wimbledon studios are encouraging but don’t pressure you to do anything you feel uncomfortable with — you’re free to sit out and cool down as often as you like. 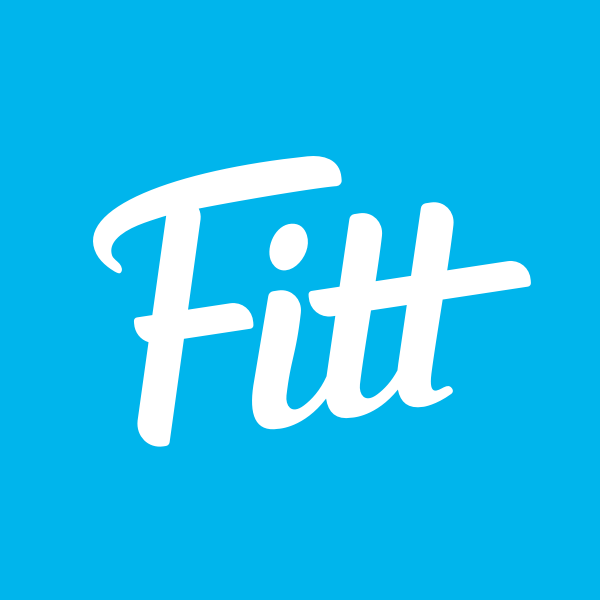 Fitt Tip: bring a towel (you can also rent one if you forget). You’re going to need it. When you need a place where you can respect the roots of ancient yoga without memorising Sanskrit phrases, you hit up Fat Buddha Yoga created by DJ and Nike yoga trainer Jessica Skye. Whether it’s on a sunny rooftop, basement nightclub, or at a five-star hotel, Jessica’s pop-up venues (Holborn, Dalston, Shoreditch, Central London) have her tailor-made playlists cued up to provide variety to her classes. FBY is known for never taking yoga practice (or life) too seriously — instead, they teach yoga as a tool for looking after your mind and your body. triyoga is your go-to for a much-needed restoration after a hectic working week. 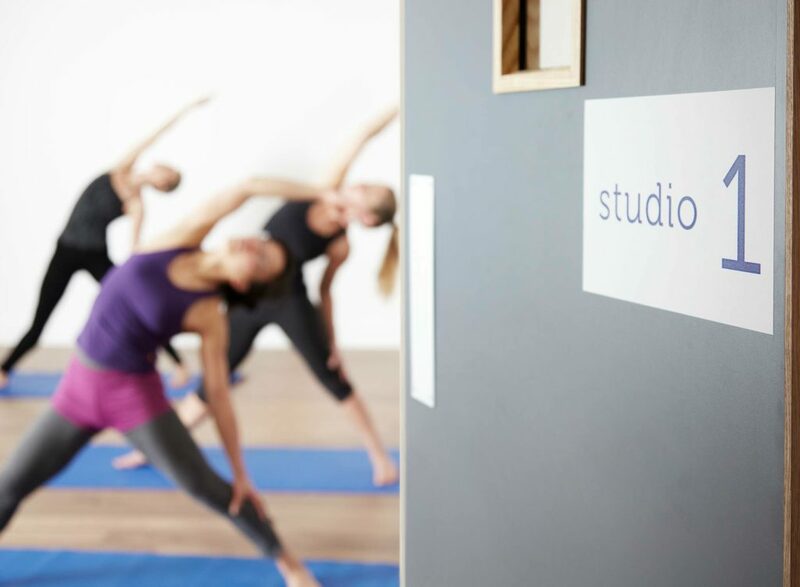 The studios spaces in Covent Garden, Soho, Chelsea, Camden, Shoreditch, and Ealing are all fully equipped with a yoga shop, healthy café, and spa treatment rooms — so you can unwind, refuel, and pamper all in one spot. They offer a great range of styles and relaxation methods all lead by highly-experienced therapists and instructors to both prepare you for your day or unwind after a stressful schedule. Escape the city chaos for an hour and retreat to a sanctuary of white walls, stained glass windows, open spaces, and calming oasis. If the idea of embarking on a new yoga journey is a little daunting, Yoga on the Lane is a good place to start. 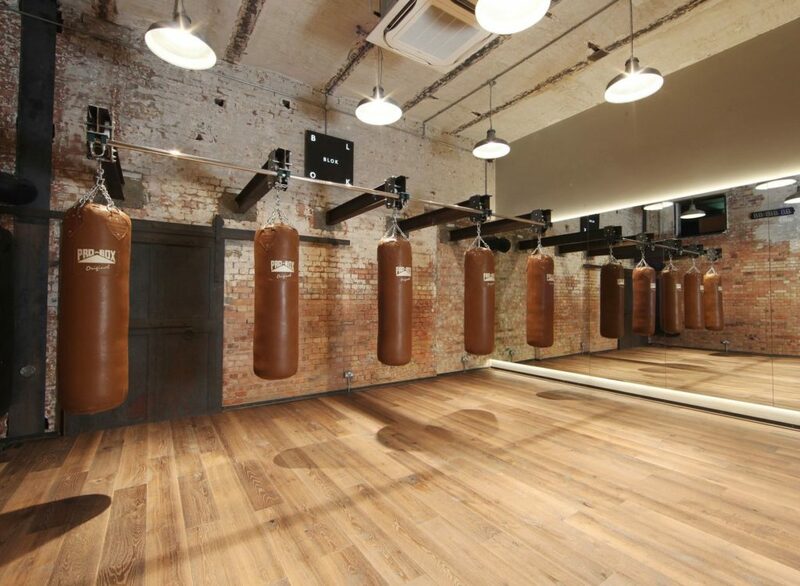 It’s not hailed as ‘East London’s most welcoming yoga space’ for nothing. 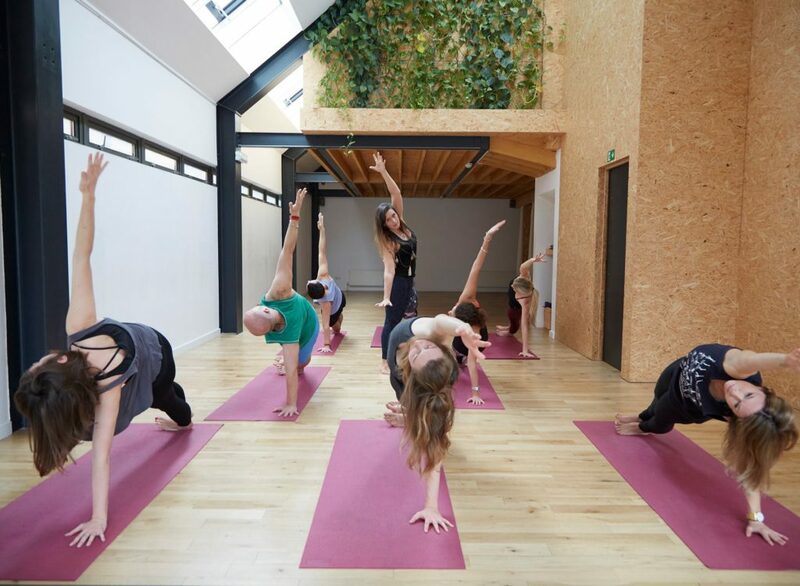 They teach a range of Vinyasa classes, courses, and workshops at their Dalston, East London light-filled studio and cater for everyone: complete beginners, experienced practitioners, pregnant women, and mothers with babies. Their special floor-warming system is also a nice touch for winter mornings, or just a general feeling of cosiness. Stepping into their West Norwood studio feels like you’ve just walked into someone’s living room — and by that we mean it instantly becomes your home-away-from-home. The Shala has created a sanctuary of self-nurturing, growth, and healing through their brightly lit and colourful studio. For almost two decades, their focus has been to enhance general well-being through yoga, whether it be for stress and anxiety relief or even family yoga. They might say it best: this is where you come to ‘find a bit of peace within the city’. We believe them. When you need a cosy, home-like escape from the rat race, you visit The Well Garden. This holistic health studio is the ultimate space to relax, recharge, and revitalise with Yoga, Gong Meditation, and a whole host of treatments. Their restorative yoga sessions are a way to truly relax and soothe frayed nerves. While you’re there, ask how the Well Garden can possibly even help lower blood pressure, stabilise blood sugar levels, increase good cholesterol, improve digestion and fertility, and reduce muscle tension, insomnia, and generalised fatigue. 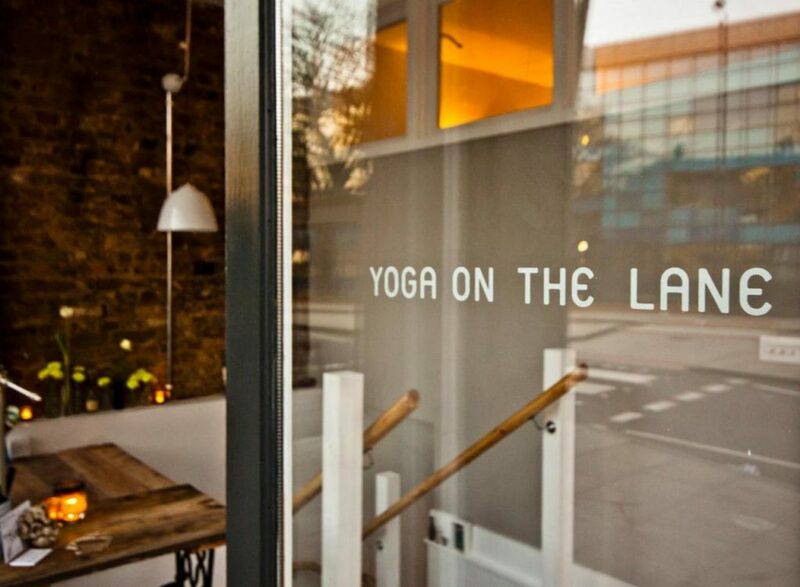 FLY LDN is the new kid on the block, and they’re taking the London yoga scene to new heights. 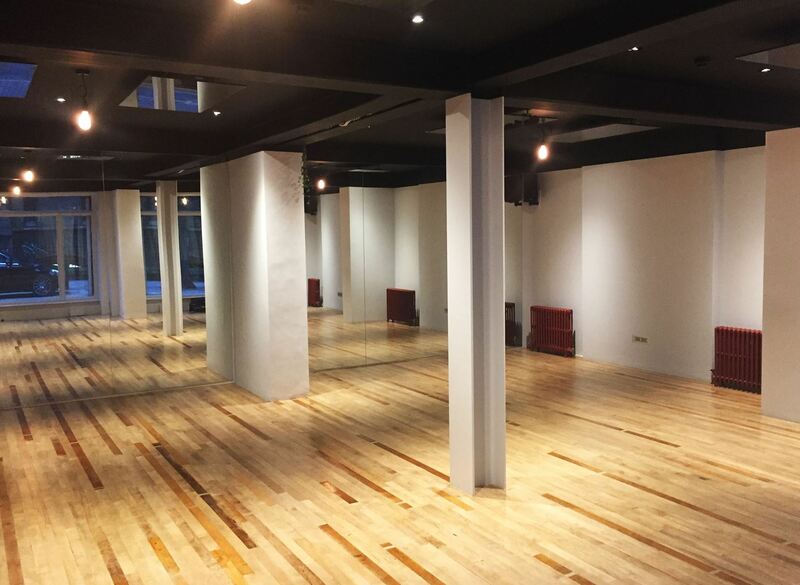 Their newly-opened studio in Creechurch Lane is dedicated to creating the ultimate immersive yoga experience. Expect breathtaking visuals on a cinema screen and carefully curated playlists in each class. The goal? To help you achieve a state of bliss you’ll struggle to find in your average yoga class. There are also five different classes to choose from — each differing in difficulty level and pace, so there’s something to suit every type of yoga personality. Try your first class for £10. But be warned — you may be hooked afterwards! It’s all in the name. There’s nothing but positive feels all around when you step into their softly lit, warm, open, and extremely calming studios in Fitzrovia or Covent Garden. They offer a variety of classes to help boost flexibility and improve overall well-being. And the restorative yoga class is what we deem a necessity for any standing desk-deprived office worker (aka 90% of us city dwellers). Say goodbye to pesky muscle pains and hello to a better posture. With two studios in the heart of the East End, Stretch London has built a reputation as one of the most inclusive and community-focussed studios, with a real sense of ease that stays with you from the very first visit. Classes are lead by a team of expert instructors who aim to encourage all levels and styles—minus a holier-than-thou tone—making it an ideal and appealing experience for anyone wanting to dip their toes. So for those looking for a space to bond with a welcoming yoga family, this is your place. Aptly named with a pun for ‘utopia’, Yotopia will indeed take you out of your reality and into a serene state of mind. Their ‘intelligent movement’-centered, technical styles are the perfect marriage between serious scientific know-how and the traditional teachings of ancient yoga. You’ll find zen, but only after you’ve been put through your paces. 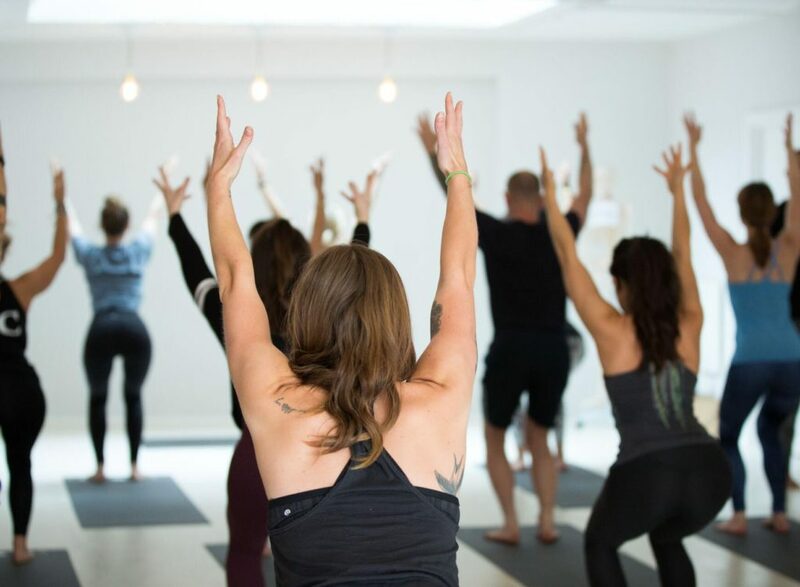 From gentle and dynamic flows to relaxing Yin Yoga, Rocket Yoga, and Dharma Mittra, they have a class to suit every ability — and they’re all led by some of the best teachers in town. 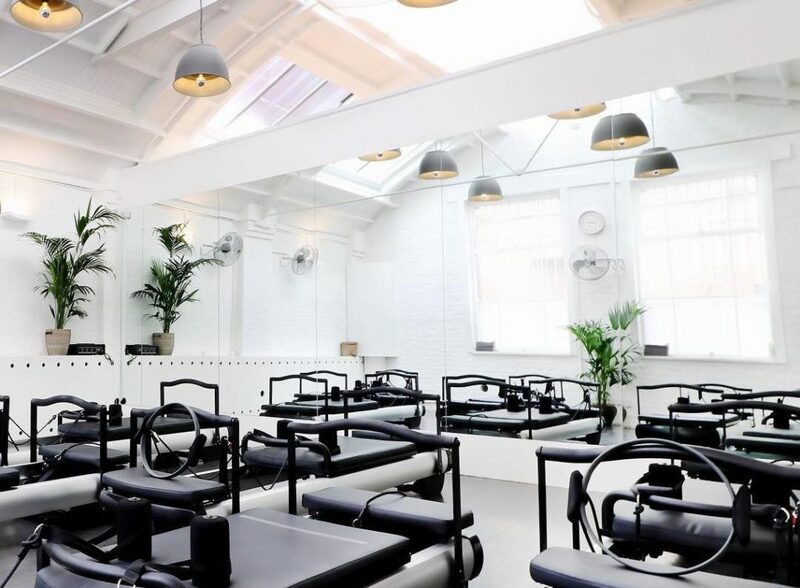 Their centrally-located Covent Garden studios are flooded with natural light, and certain evening classes are lit with candles and incense for a truly immersive experience. Major bonus: Showers are complete with REN products to stay on par with their luxury aesthetic. Calling all West Londoners — whether your focus is improving fitness, weight loss, reducing stress, or general well-being, Evolve provides all the tools you’ll need to get there. Their South Kensington studios are fresh, with beechwood flooring and crisp, white walls. They offer a range of classes for all levels and include liberating aerial sessions that should really not be missed. With your bodyweight partially or wholly supported, you’ll almost instantaneously feel more at ease and relaxed. And the swing will allow you to do things with your body that you’ve never done before, so it’s virtually impossible to go without laughing or cracking a smile. When you’re looking for a little more than downward dog and warrior poses, yogahaven is the answer. Complete with plenty of sun salutations, yogahaven focuses on whole-body movements combined with breathing techniques that will not only make you sweat but will tone and strengthen. Want the same endorphin rush as you get after a good run? 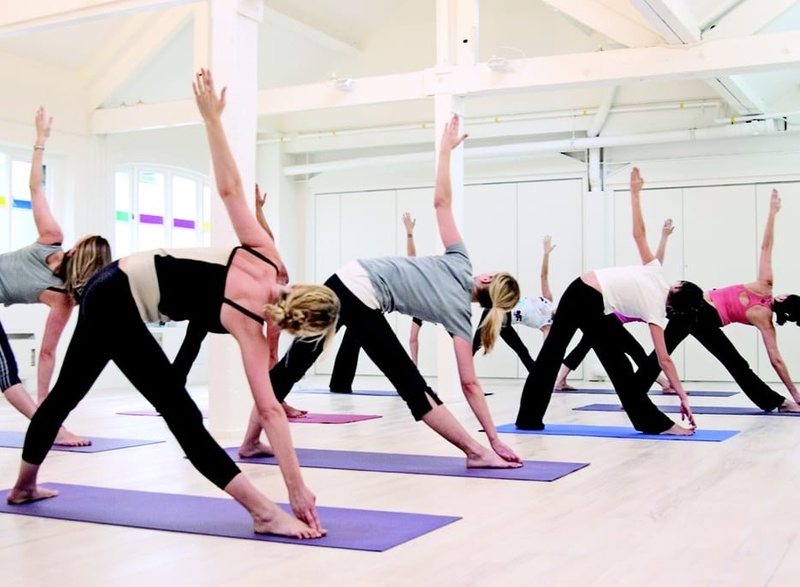 Jump in on a Hot Flow Yoga class, a low-impact session that’ll still rocket your heart rate. Studios dot Clapham, Islington, and Richmond and are spacious, bright, and mood-lit with calming colours (it makes a difference; you’ll see). The Life Centre has become an integral part of the communities in Islington and Notting Hill since 1993. 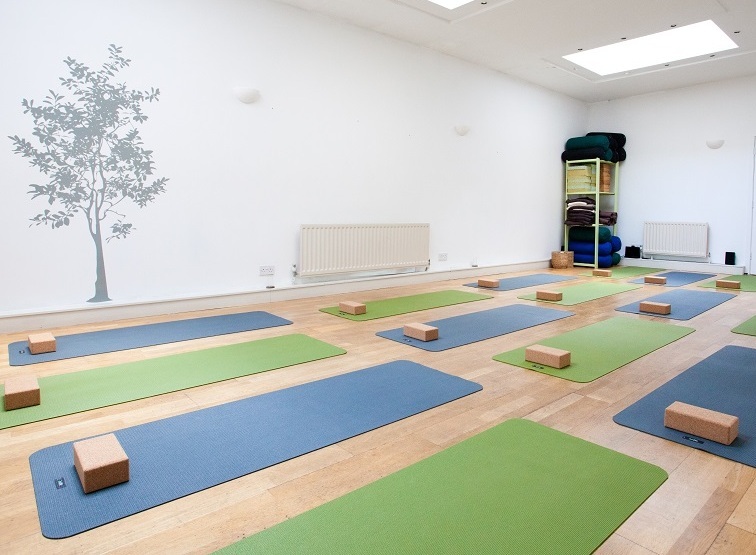 The Life Centre is one of London’s oldest centres dedicated to yoga, Pilates, and other therapies, solidifying them as a heavyweight in London’s yoga game. They believe there is a yoga path for everyone and, in turn, offer classes led by some of the UK’s top teachers that cater to all levels and a huge range of styles. Whether it’s their huge, warm-lit warehouse conversion in Islington or the beautiful, quiet converted house and chapel in Notting Hill, you’ll be welcomed with a smile. And after your first class, count on being greeted by name. As the brainchild of dancer Jacqui Hooper and osteopath Bertie Russell, it’s unsurprising that Rebel Studio in Kings Cross is not just any old yoga studio, it’s one that’s centred around spine health. Not only do they have an osteopathy centre attached, Rebel Studio also offers specialist yoga classes that are focused on form first. Two teachers take each class — one leads the class, while the other helps you nail each pose in the safest and most effective way for your body. The best part? Classes end with neck massages for every student!